It has been five years since India won its first international ice hockey match. It’s been nine years since they’ve been participating in the IIHF Challenge Cup of Asia. Last month, the women’s team finished a respectable 4th in the 7-team Challenge Cup held in Thailand. But all these achievements have not registered with sports ministry – which still fails to recognise the Ice Hockey Association of India. And this means they’re forced to raise funds themselves to keep going. At the time of writing this story, the Indian men’s ice hockey team is in desperate need of Rs 12 lakh to confirm its participation in the 2017 IIHF Challenge Cup in Kuwait. They’ve already spent Rs 26 lakh on training in Kyrgyzstan. The team has already spent most of their personal funds on training well. Now, with just a week before the Kuwait tournament, they are falling short of 12 lakhs INR to participate in the tournament. They need this fund to pay for their travel tickets, visa, equipment and coach,” a press release said – urging people to donate. Scoopwhoop News had reported on the Indian women’s ice hockey team in May 2016 – and nothing has changed since then. 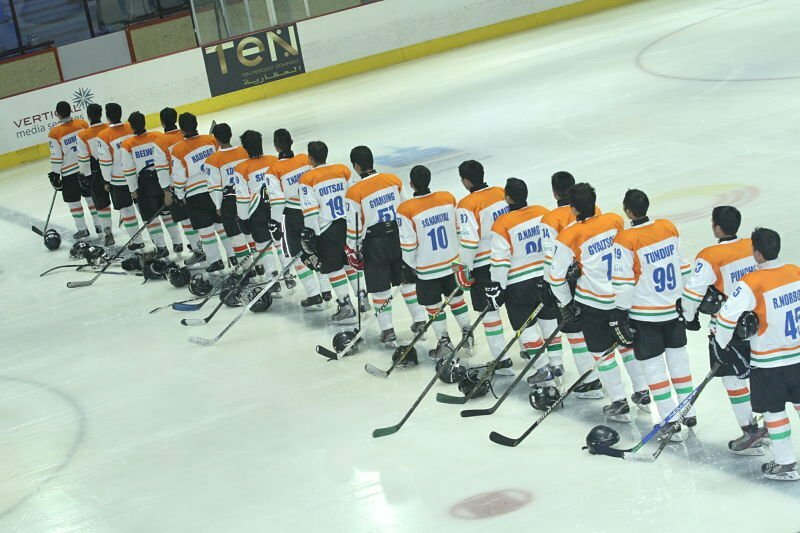 Indian Ice Hockey Team rides on the sheer will of 22 young Indian players from the Himalayan region of India. They invest their own money, their parents’ savings, the support of their well wishers (and) meager sponsorships to proudly wear the Indian jersey in international arenas. And force the world to stand up and take note of India’s talent. And climb the ladder of ranking one tournament at a time. The only saving grace in this dismal scenario has been the generosity of spirit of the common India public. Who have been contributing in crowd funding campaigns to keep the hopes of Indian Ice Hockey teams alive. Again. And again. But what is truly sad is that the government, despite a massive push in other sports, has hardly taken notice of ice hockey. Despite ice hockey being a sport that could flourish in north India, all the Indian team has is one rink in Dehradun to practice on – and that too, has been shut for the past 5 years. This means the teams have to go abroad and use facilities in other countries to train. It’s so bad that the women’s team trained on a frozen lake in Leh to prepare for tournaments. Participation is essential for the growth of the Sport. Few wins and we hope the government and Indian sports enthusiasts will be taking note of this sport. Ice Hockey being the fastest contact team sport, this Winter Olympic sport will soon become popular in India. What this sport needs is the attention of investors and it would be as popular in India, as NHL is in North America,” general secretary of Ice Hockey Association of India Harjinder Singh said. Just seven days are left for the team to prepare for the tournament in Kuwait. Seven days to get enough funds and hope that they can participate in an international tournament – something that should be their right in a country where sport is flourishing. And it’s sad that one sport, which clearly has potential, is being completely ignored.